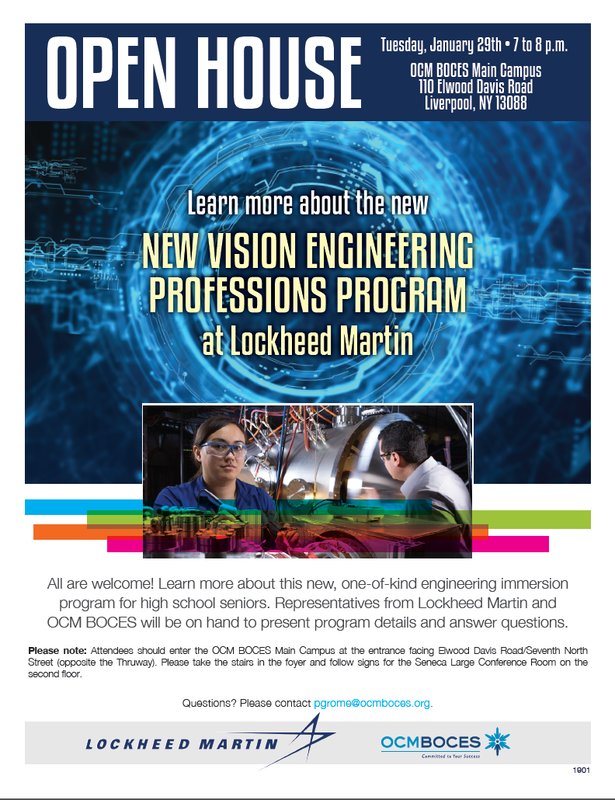 The Onondaga-Cortland-Madison BOCES has recently partnered with Lockheed Martin to unveil the New Vision Engineering Professions program! An open house detailing this program (and what it will mean for students) will be held tomorrow at the OCM BOCES campus (110 Elwood Davis Road, Liverpool NY) from 7-8 p.m. All are welcome. Please click on attached flyer, or see below for more information. OCM BOCES is excited to announce a new partnership with Lockheed Martin that will result in a one-of-a-kind engineering program for high school seniors, one that puts them side-by-side with Lockheed professionals at the Electronics Park campus in Salina. The program, called New Vision Engineering Professions, will be an engineering immersion program geared toward highly motivated seniors. Students will work with Lockheed engineers on projects in aerospace, defense, security and advanced technologies. In addition to having an invaluable experiential learning opportunity, students will also be able to earn college credits through Onondaga Community College (OCC). The program will start in the fall.